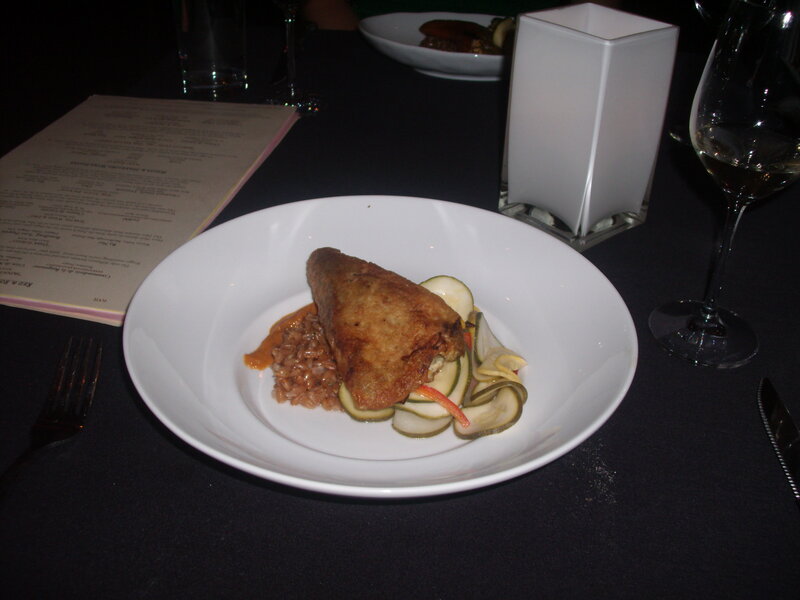 A friend and I visited Flyte World Dining and Wine during Restaurant Week. Last September. Hey, sometimes it takes me a long time to write about things. We specifically chose Flyte because their Restaurant Week menu said “vegan options available.” Vegan options available?! Sign me up! Besides having great food, Flyte is a beautiful restaurant space. The lighting is not so dim that you can’t see but not so bright that it doesn’t feel cozy. Exposed beams and pipes lend an industrial feel, and striking artwork adorns the walls. Breaks in the warmly hued walls reveal bare bricks. Seriously, this place is lovely. After being seated, we informed our server that we were both vegan. The server was very knowledgeable and knew exactly which menu items were appropriate for us. 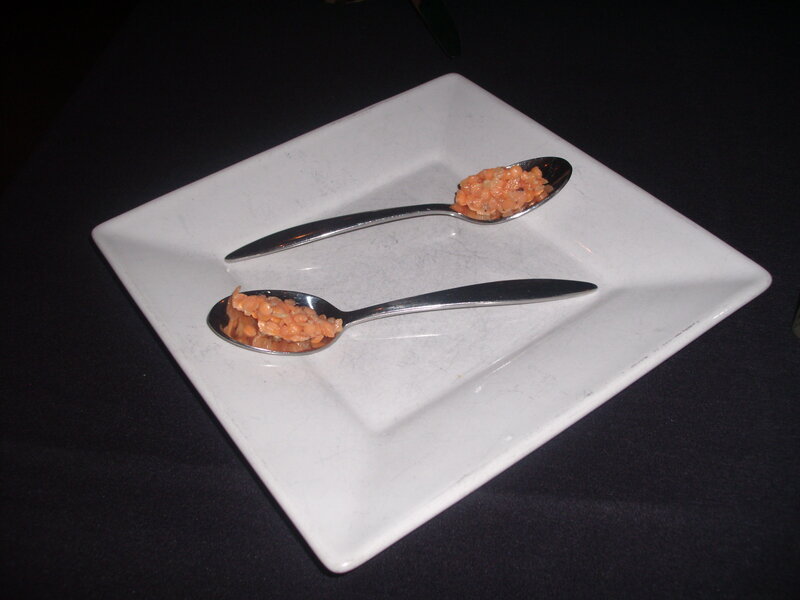 We were both surprised when, after ordering, we received the amuse bouche pictured above. I mean, really, vegan amuse bouche? Clearly, this place was class all the way. What you see here is a simple but very delicious salad. Mixed baby greens and tomatoes are served on top of a pile of pesto. Vegan pesto. Pesto sans cheese. I could hardly believe my good fortune. A few pine nuts are hanging out on the margins for good measure. Also, in the top right? Yeah, I have three glasses of wine. That’s because Flyte is known for its flights (get it? get it?). You can choose from all sorts of flights of three, like French whites, Spanish reds … you get the idea. I’m a sucker for any kind of “sampler” so I was sold on the idea. My dining companion and I ordered exactly the same thing for all courses. Up until this point, our food had been identical. When our entrees came out, they were slightly different. Our server informed us that the chef had prepared our entrees differently so we would have some variety. We both had the stuffed poblano pepper, but one was baked and one was fried. They don’t look so different in the photos, but they certainly had different flavors and textures. I was presented with the baked version and my friend was presented with the fried version, but we ended up swapping. What we have here is a giant poblano pepper stuffed with tasty things that you can’t really see (corn, beans, spices, goodness) served atop a grain whose name I cannot recall, delicious sauce, and a vegetable medley of zucchini, squash, and bell pepper. This is an entree that was creative, bursting with flavor, and more than filling. This is an entree that features vegetables as the main event and not just a side. This, my faithful readers, is the gold standard in vegan fine dining. Dessert was, appropriately, a “Flyte” of three refreshing sorbets. 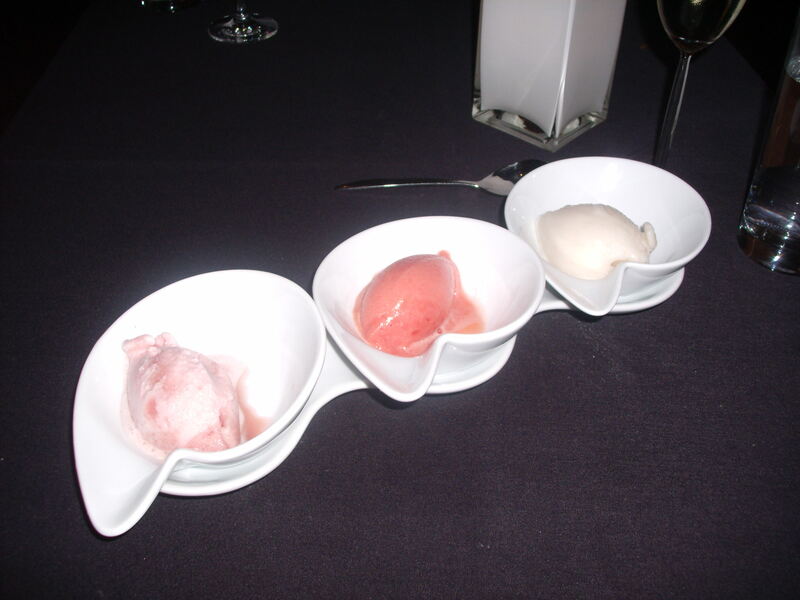 Berry, blood orange, and lemon sorbets brought a refreshing end to the meal. The blood orange was my favorite. As soon as money starts growing on trees, I’ll be back to Flyte. I’m exaggerating a bit about the price–it’s not exorbitantly expensive, but it’s a little out of my grad-student I-eat-a-lot-of-peanut-butter price range. The next time Restaurant Week rolls around, you should absolutely make reservations for a $30.11 prix fixe world of awesome. And, you know, think about treating your favorite vegan blogger. A quick glance at the Jackson’s menu doesn’t seem to offer much in the way of vegan option. Never fear, though! There are treasures within, and you will be fed. When I sat down here I was skeptical, so I ordered the shot of the day as a starter. It was tasty, and I was ready to grill my server about the vegan-ness of various menu items. Thankfully, my server was pretty knowledgeable, though he did have to go back to the kitchen and ask the chefs a few questions. 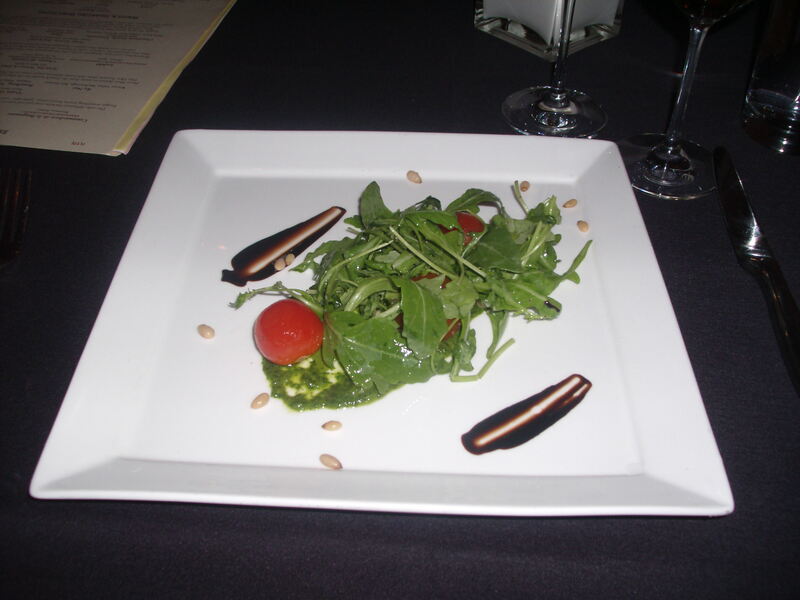 Taking a look at their menu online today, I’m not sure that they still serve the exact salad pictured above, which is a shame, because it was really good. 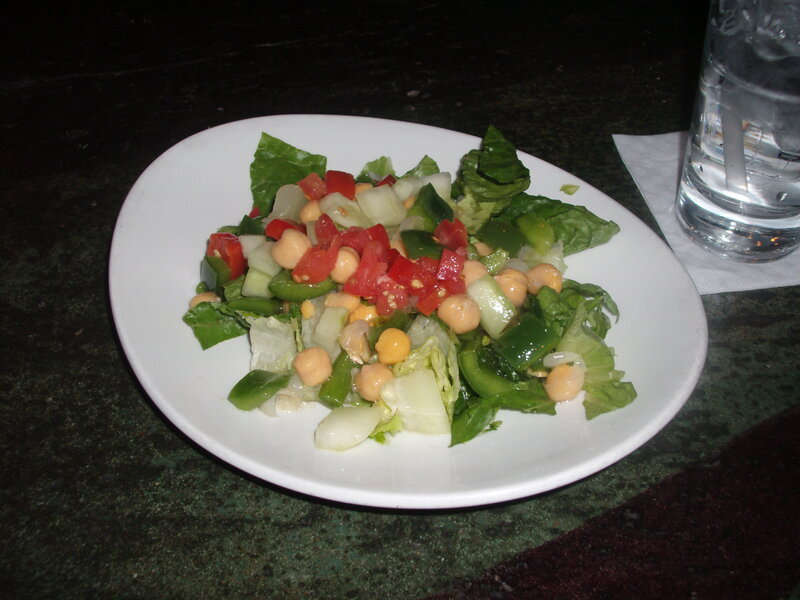 Lettuce, tomatoes, cucumber, corn, and chickpeas topped with champagne vinaigrette? I’m on board! Their menu now features a “shredded salad” instead which doesn’t sound as exciting: chopped cabbage, carrots, and red onion with the same dressing. Boring, right? Yeah. And it doesn’t have any protein. Bummer. Maybe if we all ask nicely we can get the delicious chickpea salad back. 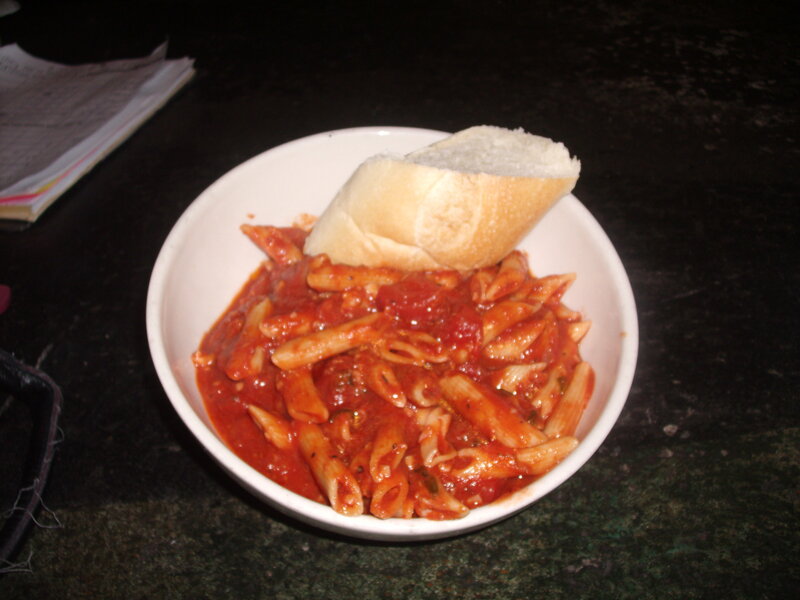 That’s right, it’s a bowl of penne with marinara sauce. Is it fancy? No. Does it hit the spot, especially after all those shots of the day? Yes. This is actually really really good for basically just being wheat and tomatoes. The sauce is surprisingly sweet (in a good way), and it’s very flavorful. I would absolutely order this again. Be sure to tell your server you don’t want any cheese on top. Plus, the hunk of bread that comes with it is vegan, which surprised me. This portion is a lot larger than it looks, because the bowl is deep–I had leftovers, which meant I had the pleasure of eating this twice. The Jackson’s menu is pretty inspired if you’re not a vegan. We vegans have few choices at Jackson’s; there is only one other menu item other than what I’ve described above, the Capri vegetable wrap sans cheese, that’s suitable for people like us. Still, I’ll probably be back to Jackson’s, if only for the great happy hour specials, and I’m sure I’ll find myself digging into a bowl of Russo Marinara again soon. Zumi Sushi is one of those restaurants that I kept meaning to go to and always forgetting about. I’m glad that I finally made it, because it’s good. Zumi Sushi is relatively new to town (opened in May 2009) and is located across from the Belcourt in what’s becoming a seriously interesting strip of restaurants. 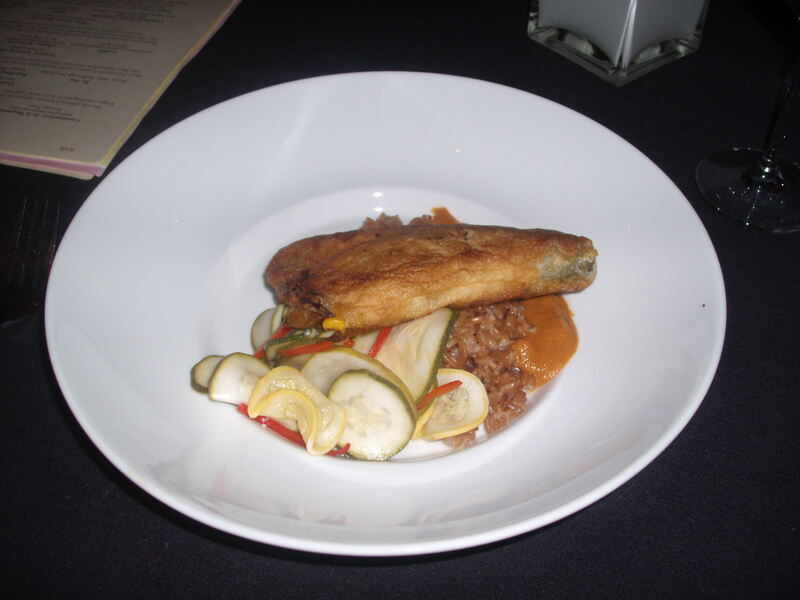 The food is affordable and very tasty, and it’s also beautifully prepared. The restaurant also features great happy hour specials that you should seriously consider enjoying on their enormous front and back patios once it warms up. 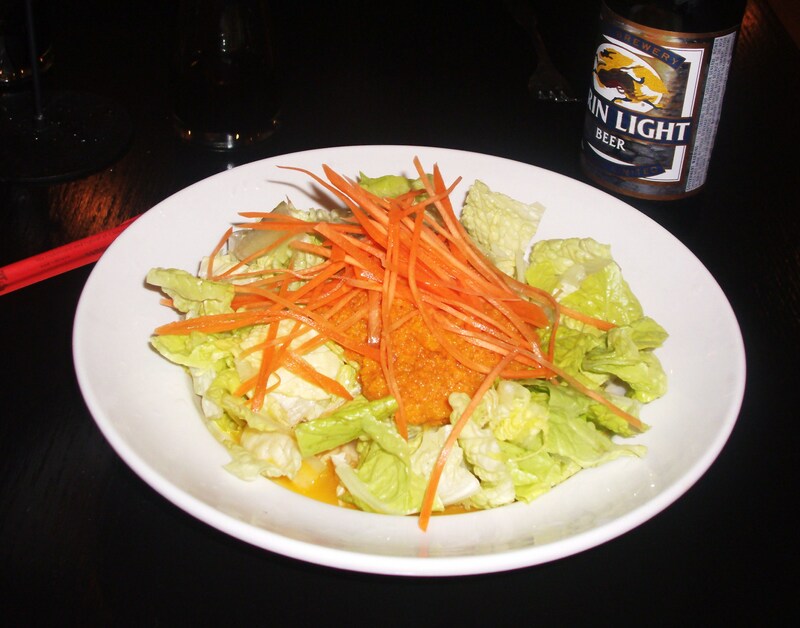 I began my meal with the House Salad, which is basically just romaine lettuce and shredded carrots, but it’s topped with house-made carrot-ginger dressing. A version of this salad is served at pretty much every pan-Asian restaurant, and this one holds its own. The dressing is really flavorful, and I liked it a lot, but it’s still just a bowl of lettuce and carrots. 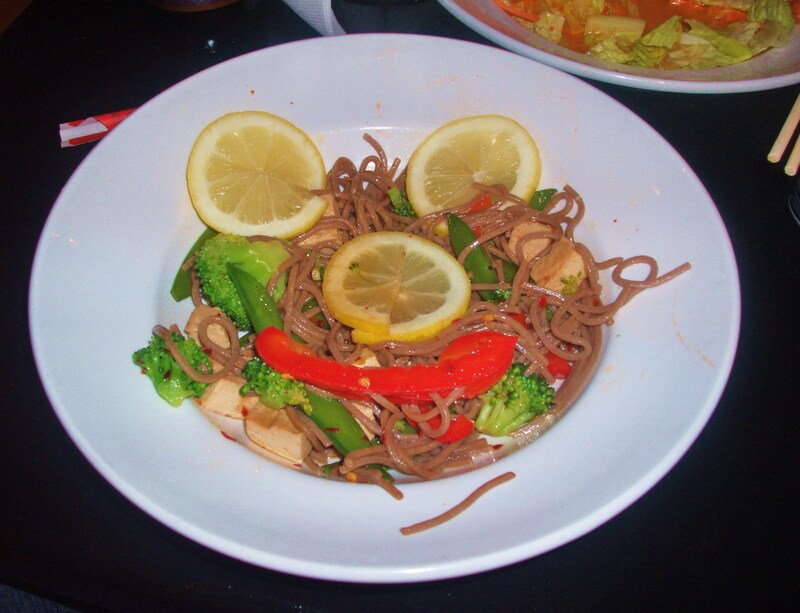 For my entree I (obviously) ordered the Vegan Soba Bowl, pictured above. I mean, come on, how could I not order the one menu item with “Vegan” in the name? The Vegan Soba Bowl is a bowl of buckwheat soba noodles cooked with tofu, veggies (broccoli, bell peppers, and snow peas make an appearance) in a vegan dashi broth. This bowl basically punched me in the face with flavor. It was surprisingly spicy, with a lot of crushed red pepper. 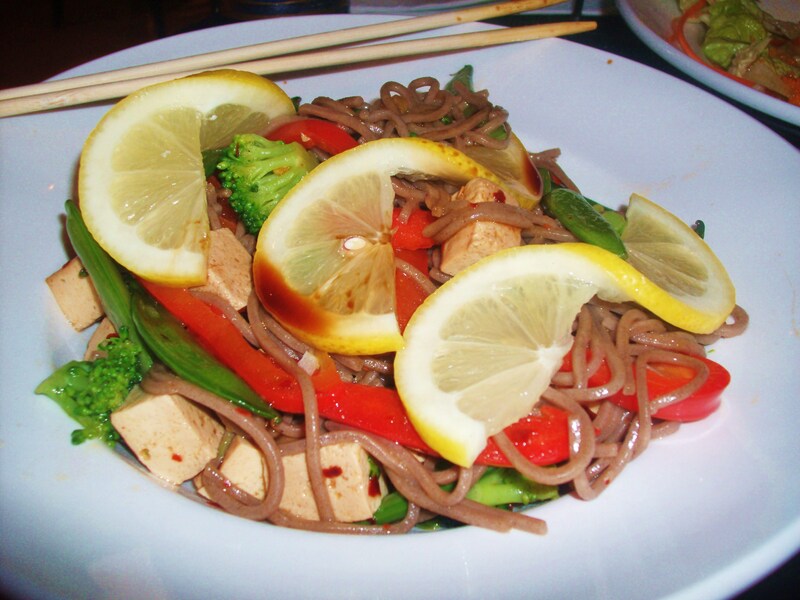 The soba noodles really hold up well with the veggies and tofu. The portion size was generous but not enormous – basically, it was the Goldilocks of noodle bowls. The grilled lemons on top were an awesome addition. On a separate visit (sans camera, sorry, blog fail) I knew I wanted to try the sushi. The Green Sesame roll was calling her sweet siren song of deliciousness, and I succumbed. The Green Sesame roll features asparagus, carrots, cucumber, kanpyo, inari tofu, and peanuts, all rolled in thin strips of avocado. It sounds good, right? It is good. And it’s eight pieces. For $5.50. OH YEAH. I went to Germantown Cafe during Nashville Originals Restaurant Week. During Restaurant Week, Nashville Originals member restaurants offer specially priced prix fixe menus and, typically, specialty menu items. Germantown Cafe (and Allium for that matter) simply offered their regular menus at a fixed price that included a salad, entree, and dessert. 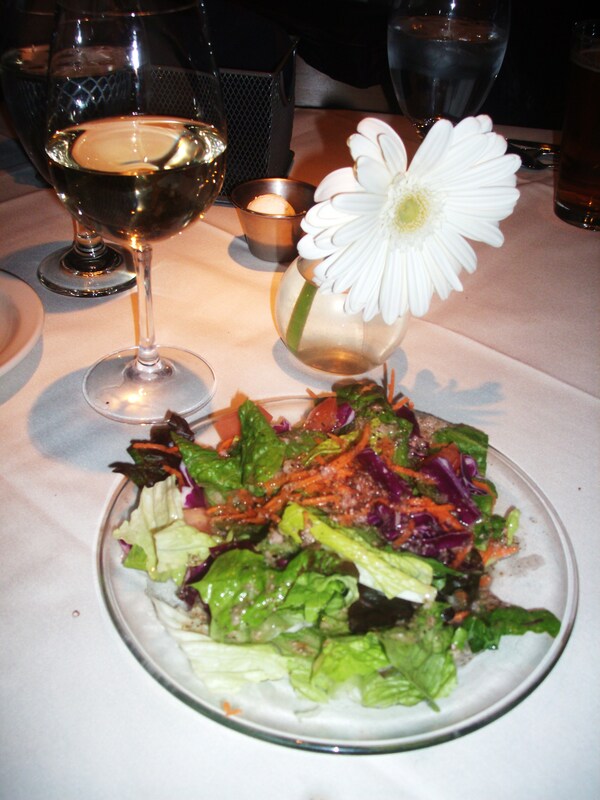 I began my meal with the house salad topped with either Raspberry or Balsamic Vinaigrette, I can’t recall. I should really start carrying a notepad. Anyway, I do remember that the salad was pretty good as far as house salads go. It was just greens, red cabbage, and carrots, but the dressing was really tasty and everything tasted really fresh. I also had the house Pinot Grigio which I liked, but I’m no wine expert so who knows. I liked it and that’s what counts, right? Also, they brought out a bread dish but the bread wasn’t vegan so I didn’t get to partake. For my entree I ordered the Green Plate, veganized. Normally, everything on this plate is coated in a fine layer of butter. Gross, right? So, that was nixed. Next, they subbed out the Butternut Squash Gratin for brown rice–downgrade. So what was on my green plate, you ask? Garlic-marinated portobello mushroom, steamed spinach, steamed asparagus, brown rice, and that little side dish of sauce. The spinach was bland, period. It seemed that it was completely unseasoned. I absolutely love asparagus so I was pleased, but at the same time it could have been seasoned in some way, or at least roasted to bring out the flavors. The rice (which you can’t see because it’s underneath the asparagus) tasted like rice–also unseasoned. The mushroom was AMAZING. Seriously, I ate every last bite. It was so very very delicious. The texture and flavor were perfect. Also, I don’t know what that little sauce was, but it really blew me away. It was kind of overwhelming on the spinach, but it really took the asparagus and mushroom to the next level. I want to have a bottle of it in my fridge at all times. 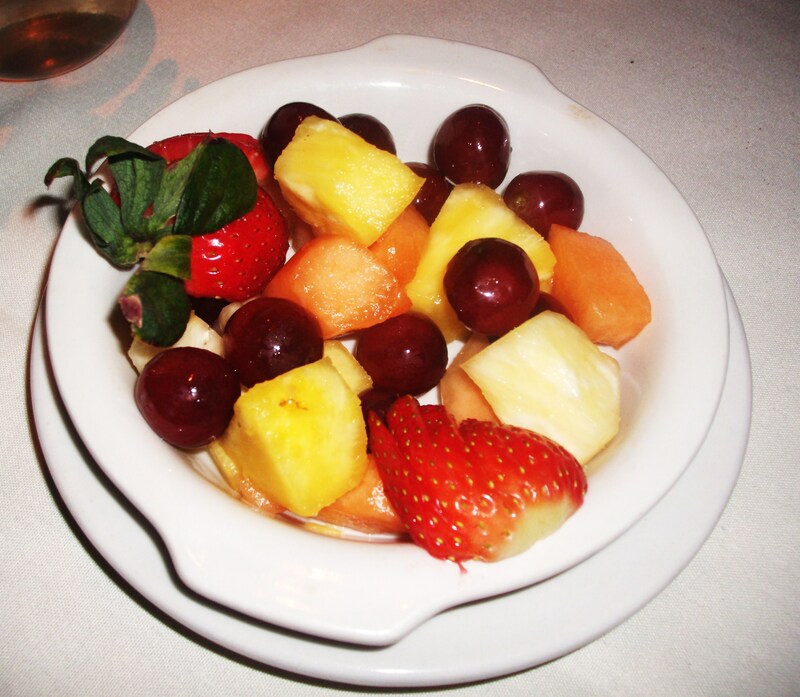 For dessert I had … this bowl of fruit. Not that there’s anything wrong with a bowl of fruit. The fruit was good and all. And it’s not like I was expecting this restaurant to have some kind of phenomenal vegan dessert, especially since I didn’t request one in advance. It’s just, you know, fruit. The verdict? I don’t know that I will be back at Germantown Cafe unless their menu changes. My salad was good but standard. My green plate was mostly flavorless except for the mushroom cap and sauce, and the substitute of plain brown rice for butternut squash was kind of a disappointment. My dessert was fruit. Worst of all, I was still kind of hungry when I was done with all this food. There was no solid protein source in the meal. Germantown Cafe has a really creative menu, and my dining companion was thrilled with an order of New Orleans Shrimp. 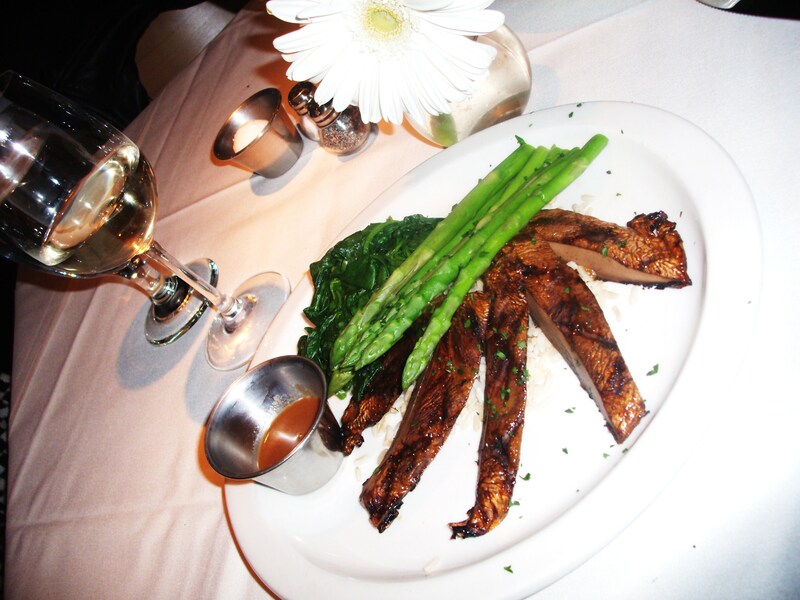 The restaurant has a lot of vegan potential, it just needs to be more fully realized–the chefs are clearly skilled. Also, I don’t think I saved any money by going during Restaurant Week–I think I would have actually spent less if I ordered my items a la carte. The best thing about Germantown Cafe was not my food but the decor, view, and ambiance. The place is really beautifully designed, and we got a table by the window with a fantastic view of the downtown skyline. It really is a good date spot. Just don’t expect your dish to wow you. This is my second and last Portland post. I didn’t have as many opportunities to eat in restaurants as I would have liked because I was so busy at the conference. But the two restaurant meals I did get to enjoy were amazing–my trip to Hungry Tiger Too was no exception. Hungry Tiger Too has a bar area and a dining area, but my host and I sat at the bar. They have two separate menus: one vegan menu and one “classic” menu. Since Hungry Tiger is known for its mac & cheese, I knew that was what I would be having. It comes in small and large, and if I had gotten the large I think I might have fainted, since I couldn’t even finish the small. The cheese sauce kind of tasted like chicken stock, which was weird, and while I’ve made better vegan cheese sauce in my own kitchen, it was awesome to order this in a restaurant. The noodles were a little softer than I would have liked, and the cheese sauce a little thinner. It was topped with delicious breadcrumbs. The real standout of this meal was the salad: this Caesar was really reminiscent of the Caesar salads I used to eat growing up, when that was the only type of salad I found palatable (wow, that was a long time ago). The dressing was absolutely fantastic. I hope I get the opportunity to return to Hungry Tiger. They have vegan corn dogs, and I would love to try one of those. Our bartender/server was fantastic and helped to make menu and beer recommendations. If it wasn’t for her, I don’t think I would have had the Caesar, which I loved so much. The place has an awesome neighborhood vibe and great beer specials. Oh man, I hope I get to go back soon!